“On days like these, when skies are blue and fields are green …” with the dulcet tones of Matt Monro wafting through the car, we made it to the French (sadly not the Italian) Alps – in shooting distance of Geneva. With three days of a road trip under our belts and not a hiccup in site, we were on our summer holiday. For various reasons, mostly work and family related, we hadn’t managed a real summer holiday for a couple of years, and so when, in the spring our thoughts turned to the summer, Stephen suggested we should relive a wonderful holiday from 1991 in Sweden. The only problem was that on further investigation, we discovered the Harwich to Gothenburg North Sea crossing had stopped about 15 years ago. So, a review of our options took us back in time to 1988, and our planned honeymoon, which my lovely hubby thought should involve a two stop break in Paris and Geneva. Fortunately we decided Paris was far too good an option for a honeymoon (O la la … and all that), and so we never did get as far as Geneva. However, that was all about to change. A road trip to Geneva is no mean feat with only one pair of arms between us, but age (or common sense for that matter) didn’t dim our plans, and with a car packed full of my clothes (with just a little bit of room for essentials like a picnic, oh, and some of Steve’s underwear!!) we left home on the 12th August. First stop – Folkestone. An overnighter with an early morning seemed like a good idea, as the plan was to do about 300 miles each day. Glorious weather followed us through France to Troyes, where our second night was spent in a hotel in the middle of retail park, which (for good or bad) appears to be a favoured overnight stop for many Brits venturing towards Switzerland and into Italy. Another early morning (how I hate early mornings) and we were on the last portion of our trip. Leaving the flat-land of southeastern France and moving into the hilly terrain of the French Alps was breathtaking in itself. However, when we eventually joined the A40 – the Highway of Titans – silence, apart from the soothing tones of Matt Monro, engulfed the car. Poor Stephen is not known for having a good head for heights, and with a steely determination not to look left or right, but just head for the safely of the tunnels through the mountains, we navigated the dramatic and awe-inspiring autoroute, also known as the “White Highway” which, during winter and spring months meanders through the snow laden Jura mountains and the Alps. Arriving in Geneva during the rush hour was an experience. There appears to an order of precedence, which goes something like … trams, buses, cyclists, pedestrians and cars. Add a complex one way system into the mix in trying to find the hotel; and negotiating the Arc De Triomphe and the Champs Elysees is a piece of cake. The hotel staff were lovely but had a little difficulty processing a rather strange request … “Can you please remove the bathroom door, as the toilet is located behind it. I’ve just travelled through the Alps with a driver who admits to just a bit of Acrophobia, and I need the loo.” The offending door was eventually removed and all was well. Refreshed and raring to go, we ventured out to find an eatery that would not break the bank on our first night. Geneva is ridiculously expensive, but the Town Square in old Geneva provided food and refreshment in good measure. Day two saw us venture to the Business quarter, and to the Broken Chair installation. I have already posted details on my Facebook page, of how we happened on a promotional event for Handicap International; and so after I was given a lesson on who is the world’s most expensive footballer, we moved onto the United Nations. Having toured the UN in New York, we were keen to see the difference, and the tour did not disappoint. It is a unique spectacle of glamour, beauty and quiet civil service-like efficiency, that makes the Geneva UN totally different from the briskness of the UN in New York. Day three took us on a boat trip from Geneva to Lausanne. The trip was kindly organised by one of my fellow Cardiff University Honorary Fellows (Philip Jennings – himself a Cardiff boy, but now based just outside Geneva and currently General Secretary of UNI Global Union). Lake Geneva is as enigmatic as it is dramatic. The small lakeside enclaves, are the stuff of calendar pictures and no photograph can really do them justice in terms of the their beauty and serenity. Seven hours on the Lake, left Steve a golden brown, with me looking like a lobster, but well worth the eventual peeling of my nose, as we saw some of the most spectacular mountain ranges and cloud formations, I have ever seen. On Day three, we met with Eric Carlson and Jurgen Menze from the Disability Unit of the International Labour Organisation. One of the most striking things to come from our meeting was the extent of the humanitarian work being done by the UN and related organisations to improve the life chances of people from all walks of life. The work being done in the UK to promote disability equality is mirrored by the work of the ILO, and there are many areas which, I believe, a mutual approach to mainstreaming disability equality would be so advantageous. There is clearly still a long way to go, but with perseverance, I really do believe that disability equality will become a global issue, which can only be for the good. With wall-to-wall sunshine still greeting us each day, we decided Day four, would be an ideal opportunity to try out the accessible trams and buses. We ventured back to the Business quarter to visit the International Red Cross and Red Crescent Museum. It wan’t at all what we expected – in fact rather disappointing, and the disappointment was compounded by the lack of accessible toilet facilities … in a building which seeks to promote the highest standards of humanitarian work. I think they need more than a little Disability Equality Training, but that may be for a return trip … who knows! With an eye on the weather which, we were told by the reception staff at the Red Cross, was about to turn wet, we collected those awful bin-liner rain capes from the museum shop, and decided to head back to the Cornavin – the main bus station, which did have accessible facilities. We knew what bus would take us back, but the heavens decided to open, and by the time we got the rain capes on, got to the bus stop and onto the bus, we were drenched. I’m not sure what it is about Steve, rain and wheelchair controllers, but almost six years to the day, since his controller died in New York, exactly the same thing happened again. We made it to the Cornavin, and back to the hotel (just) and by bedtime the chair simply died. The morning of Day five, was therefore spent trawling Geneva, for a wheelchair repairer. However, the concierge at the hotel were fabulous. Within two hours of a call to the reception, we had a wheelchair repair man arrive at the hotel, take the chair away, determine it needed at new controller, locate a hire scooter for the weekend, take Steve’s chair away for repair, and get it back to us on the Monday with a new controller fitted. The hire scooter was enormous – christened “Big Bertha”, but it did the job. 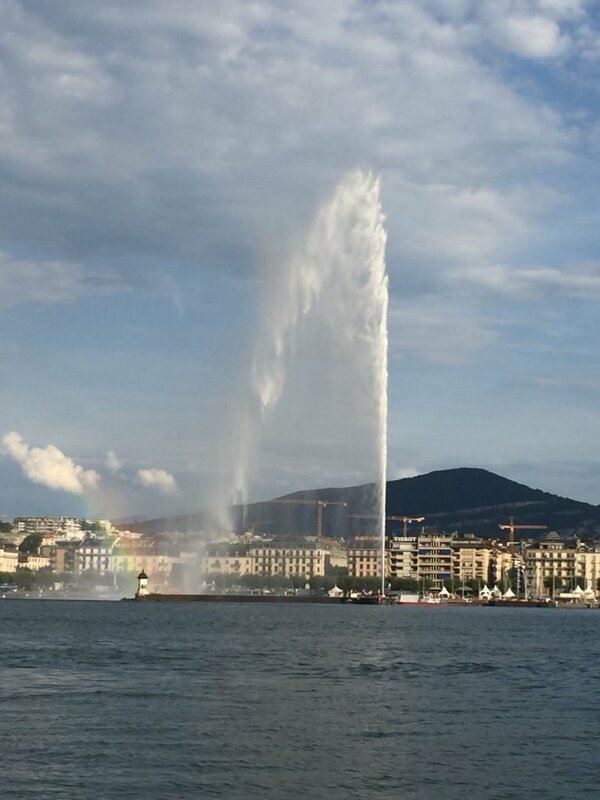 It allowed us to continue to explore Geneva, which is clearly a city founded on immeasurable wealth. However, it also relies on tourism to buoy an economy that needs ordinary holidaymakers, just as much as it needs international businesses, to survive. 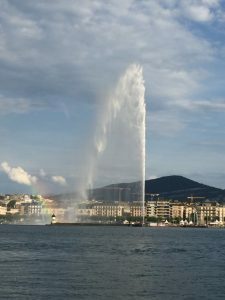 Geneva is probably not the most accessible city we have visited, but that is more than made up for, by the genuinely helpful people we encountered every day we were out and about. As we came to the end of our holiday, and prepared for our return road trip, I had managed to add another one or two bags to fit into the car. I say it was laundry, but Steve insists it was my shopping … Let’s just say it was a combination of both. We left Geneva, and by default ended up on the main Alps roads, which wandered up and down stunning valleys and gorges. Steve was happy, having taken more than a few photographs of the Jet L’eau. This was probably the only thing he really wanted to see in Geneva – and fulfilled a boyhood ambition to see the Jet which had featured in the 1960’s TV series the Champions. Simple things! A well powered car, and a full tank of diesel saw the miles on the autoroute back through France disappear in no time, and after an overnighter at the hotel on the retail park, we found ourselves back in Calais. A final stop at Citi Europe – well, the odd bottle of Rosé for Rosie doesn’t go amiss, and we were being shuttled through the tunnel at a pending bank holiday rate of knots. Four hours later, after a journey on a virtually deserted M25 and M4, we were home. Four days later, and the laundry is all done, the post has been prioritised, and we’re looking forward to a visit from James – before he starts his new job in London at the beginning of September. Where will we go next year? Well, with an ear on Matt Monro, we might be sending greetings “From Russia with Love.” There is however, one major problem, how on earth do you ask for the toilet door to be taken off in Russian … Maybe the Norwegian Fjords will be safer bet! !